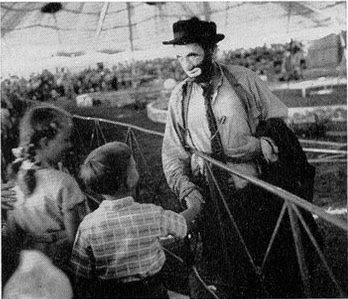 Emmett Kelly, who left Ringling during the AGVA strike in 1956 and never returned, would work Palisades Park and a few of the larger dates for Frank McCloskey's then new Clyde Beatty-Cole Bros. 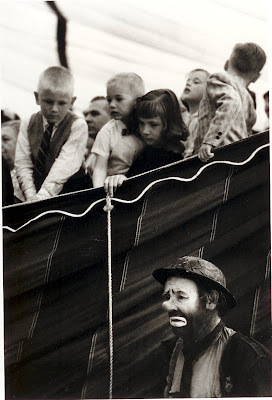 Circus each year. 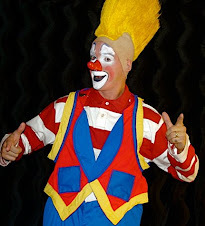 Jimmy Armstrong, another Ringling clown who jumped ship to join the Alley of the new show. 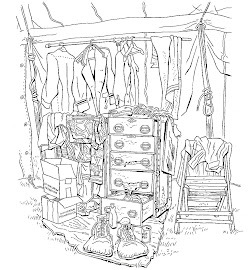 A page from a Cole Bros. 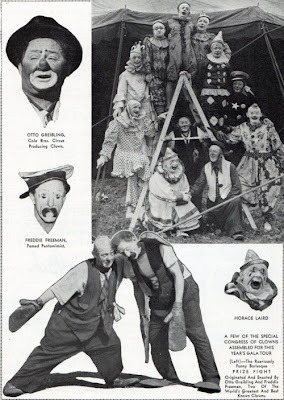 Circus program showing Otto Griebling, Freddie Freeman and Horace Laird were held in high esteem over there and that Otto wasn't superstitious. 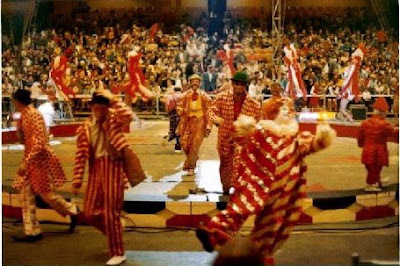 Michael Karp is from and center in this photo of the newly minted Clown College graduates on the floor in 1969. 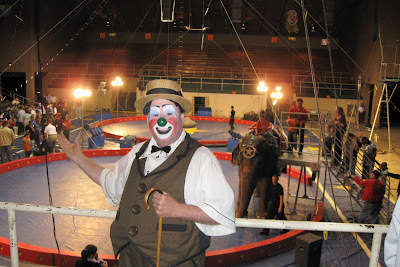 Every single network television detective show since the dawn of TV eventually does an episode on the circus, and every single one of them repeats the same old tired cliches. Every. Single. One. How many can you count from this 1989 episode of Matlock? 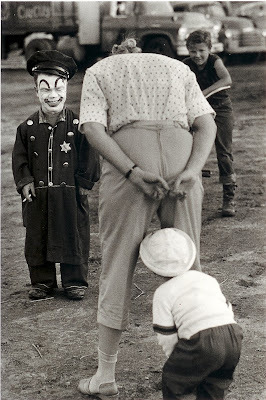 How many real circus pros can you identify in the background? 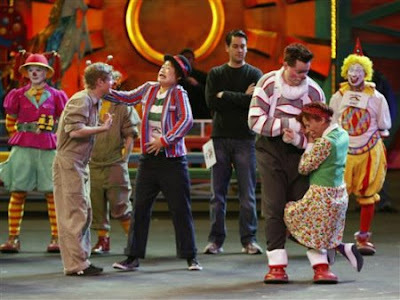 Why didn't they bother to ask any of them what a circus is really like? 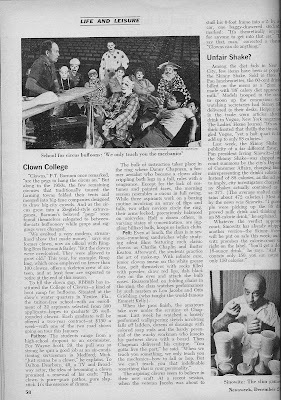 Here is the entire December 2, 1968 Newsweek article on Clown College. 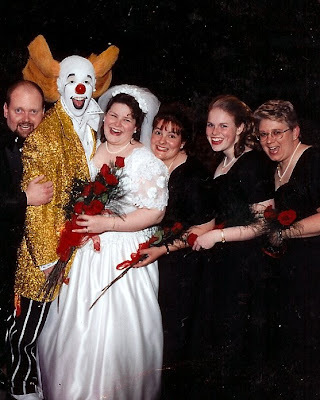 Clown College grad Michael Davis taking part in a very early Comic Relief fundraiser. They don't do them annually anymore so I guess they either completely solved the problem of homelessness or there just wasn't anything worth satirizing in the last 8 years. Michael has done quite a bit of television and I always look forward to seeing him. 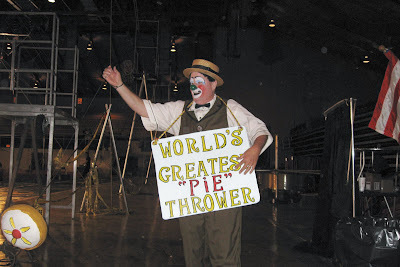 I believe he is now performing with Teatro Zin Zanni. 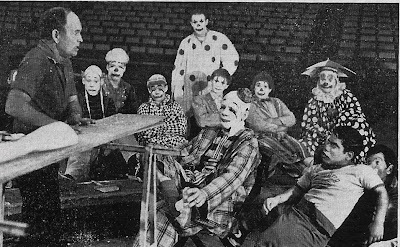 Quite possibly the first national coverage of the Ringling Bros. and Barnum & Bailey Circus' "College of Clowns" was a Newsweek article from the December 2, 1968 issue. Pictured here is Danny Chapman teaching the class Mike "Coco" Polakovs' painters entree. 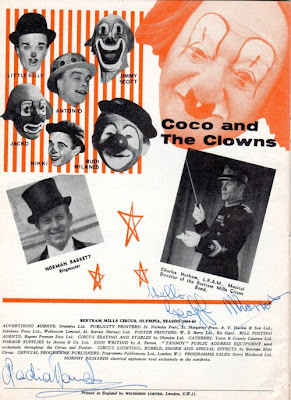 No wonder Coco was none too keen on Clown College! Perhaps Michael Karp can help identify some of the others. 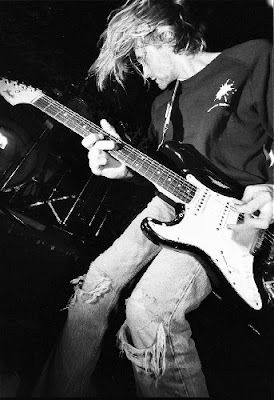 Thanks to everyone for your contributions to identifying the performers in the photo so far! "HERE I COME TO SAVE THE DAY!!!" GREENVILLE, S.C. (AP) -- Shriners hospitals, which have provided free care since before the Great Depression, are considering closing a quarter of their facilities as donations stagnate, costs increase and the charity's endowment shrivels. The group's director says it's the only viable option. Officials at the Florida-based organization say it is siphoning $1 million a day from its endowment to balance the budget for 22 hospitals in the U.S., Canada and Mexico. 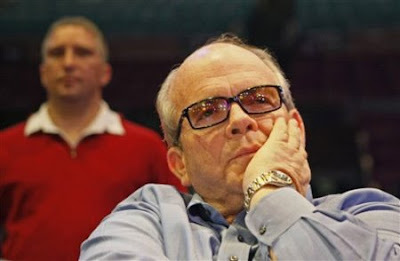 Meanwhile, they say, that fund has fallen to $5 billion from $8 billion in less than a year because of the sputtering stock market and a charitable giving slump that has hurt philanthropies nationwide. The fund has been declining since 2001. The group will vote this summer on the closures. "Unless we do something, the clock is ticking and within five to seven years we'll probably be out of the hospital business and not have any hospitals," Ralph Semb, chief executive officer of Shriners Hospitals for Children, told The Associated Press. In cities where hospitals may close, supporters and hospital staff are scheduling fundraisers and posting online messages of support on social networking Web sites. In Greenville, S.C., Bridget Myers and her daughter are turning to churches and friends, collecting money in a bucket tagged with pictures of X-rays and Shriners patients. "I've collected $92 dollars in two days," said Brooklynn Myers, 14, who received scoliosis treatment at the Shriners' Greenville hospital. "Me and my mom feel like it's heartbreaking we'd have to drive all the way to Lexington (Kentucky) and we've made special bonds here." Widely known today for burn and orthopedic care for children, the Shriners Hospitals system opened in 1922 with a facility in Shreveport, La., that specialized in treating polio. By the 1960s, the group had hospitals nationwide and expanded its care to include spinal cord injury rehabilitation, cleft lip and palate care and medical research. More than 1 million children have been treated at the hospitals, which were created by the fraternal organization of the same name whose members are known for wearing red fezzes and driving miniature cars in parades. The care is free to all. In 2007, the fraternal group was hit with accusations it used money intended for the hospitals to throw parties - but only a fraction of the hospitals' funds are raised by the group. Most of the money to operate the hospitals has come from interest from the endowment, Semb said. Semb said this year's operating budget for the hospital system is $856 million. The budget has risen by $100 million each of the past two years while donation levels remained static, he said. Last month, the Shiners' board of trustees voted to close four of the group's eight research centers and lay off about 40 people at its administrative office. At the organization's annual meeting July 6-8 in San Antonio, about 1,200 Shriners will vote whether to close hospitals in Shreveport, La. ; Erie, Pa.; Spokane, Wash.; Springfield, Mass., and Greenville. Semb said they were chosen mainly because of too many vacant beds. The system would shed around 225 hospital beds with the closures, according to data from Shriners hospitals Web sites. Patients would be sent to other Shriners hospitals that specialize in their ailments. The organization also will consider whether a hospital in Galveston, Texas - closed temporarily after damage from Hurricane Ike - will remain shuttered. "The outlook is not good, but we know that we can right it," Semb said. "And we can within a five-year period of time get our expenses down far enough to equal the income we have coming in and hopefully start building on that endowment fund." Closing these hospitals is the only viable option, Semb said. While members will also consider keeping all 22 facilities open - or a nationwide 30 percent budget cut - Semb contends doing either would be a death knell to the organization. He said to continue functioning as they do now with all the hospitals open, Shriners would have to grow the endowment to about $12 billion by 2014 - unlikely, given the economy and nationwide trend toward less large-sum charitable giving. Fewer groups and individuals gave gifts of more than $1 million in 2007 compared to 2008, and such donations fell even more in the final two quarters of last year, according to preliminary findings of a study due out this summer from The Center on Philanthropy at Indiana University. Even when giving was more robust - from 1991 to 2005 - gifts to health care groups grew at a much slower rate than those for other entities, like universities, said Melissa Brown, associate director of research for the center. She said the aging of once-prominent fraternal organizations might be affecting their ability to grow donations. "It could be that what they are seeing is a generational shift," Brown said. Getting the two-thirds majority needed to close the hospitals will not be easy, Semb said. Patients and their families are vowing to rally at the annual meeting. And some Shiners who have spent years raising money and volunteering say they'll oppose the move. They've done it before: A plan to close hospitals in 2003 was quickly voted down despite warnings of financial problems. In Greenville, letters of support from patients cover the wall of one hallway at the 50-bed hospital. Jason Burbage, who was born with no fingers, has been going to Shriners Hospitals since he was born in 1976 - first as a patient and now as a volunteer to give encouragement to patients. The work has become more difficult because of the financial troubles, he said. "We don't want the patients to focus on it," said Burbage, a 33-year-old Greenville businessman. "It's not a done deal. 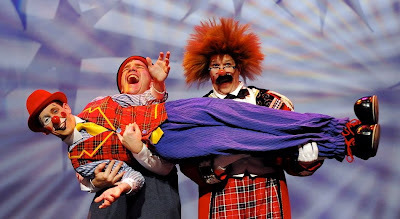 Chance Marmalade, the clown performing the wire walking gag which starts about a minute in, had posted to the Clown Forum that he'd like to see this video posted here. I think he does a nice job here. "As human beings we all want to be happy and free from misery... we have learned that the key to happiness is inner peace. The greatest obstacles to inner peace are disturbing emotions such as anger and attachment, fear and suspicion, while love, compassion, and a sense of universal responsibility are the sources of peace and happiness." Some scenes from Fellini's film with new music by Evelina Lewen. Can someone tell me if any of the performers in these scenes have an actual circus pedigree? I've never seen any of them outside of the film. 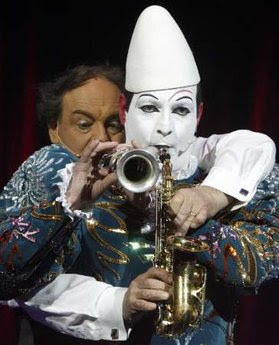 Fellini's assertion that "clowning is dead" isn't really supported when you realize that Popov, Nikulin, Karandash and others were still working in Russia; Charlie Rivel, Charlie Cairoli, The Rastellis, Joe Jackson Jr, Annie Fratellini and Pierre Etaix (just to name a few) were still working in Europe and Lou Jacobs, Emmett Kelly, Mike Coco, Mark Anthony and many others were still working in the States when the film was made. 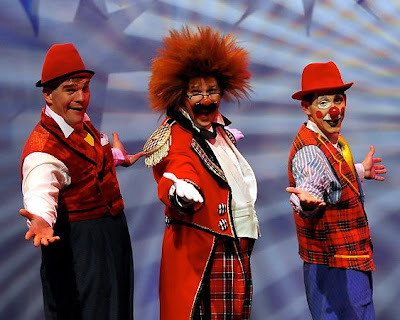 Ringling had just opened it's Clown College! 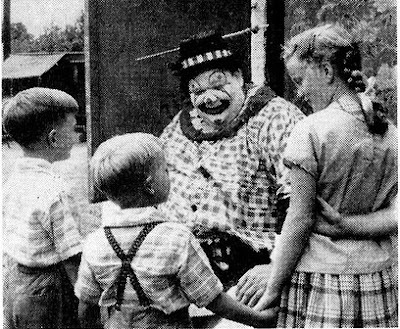 In fact, clowning was extremely healthy and would have made for a far more interesting film if he'd taken that as a premise. "The universe that we inhabit and our shared perception of it are the results of a common karma. Likewise, the places that we experience in future rebirths will be the outcome of the karma that we share with the other beings living there. The actions of each of us, human or non human, have contributed to the world in which we live. 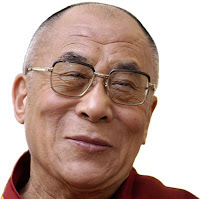 We all have a common responsibility for our world and are connected with everything in it." SHANE CASHIN: 21 In a Row!!! 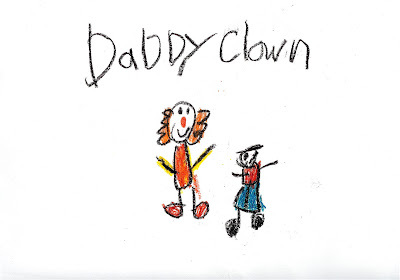 Shane has now reached 21 consecutive perfect grades in both kindergarten and first grade spelling, and drew this picture of the two of us together for an art project last week. 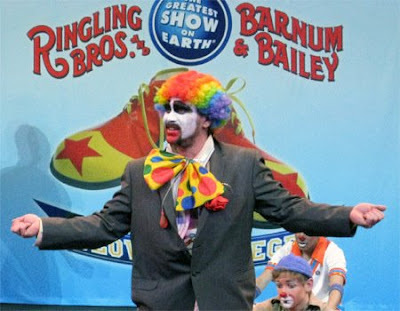 Yesterday morning Ringling Bros. and Barnum & Bailey hosted their first clown auditions in New York City since 1997, the year that I attended Clown College. Terry and I had a doctor's appointment so I arrived at Madison Square Garden after most everything was over but I got to talk with some friends in the Alley and had lunch with some others. It was really good to get together with some friends that you've never actually met and some others that you don't get to see often enough. 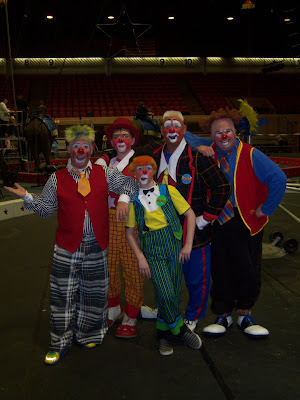 Stars of the Red Unit Clown Alley with some of the hopefuls. And, umm... did I mention that I saw a blue car the other day? 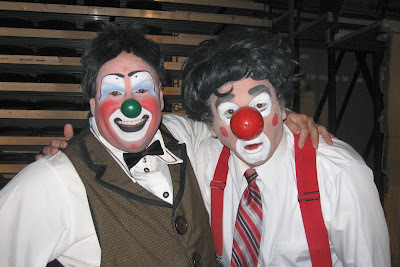 New promo photos of Mark Lohr, Andrew Scharff and myself, Cirque Idiotique. 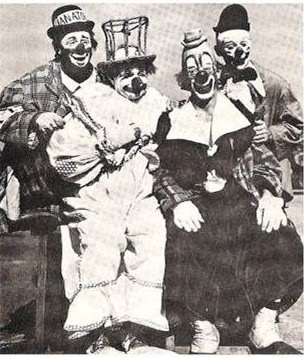 An extremely rare photo of Paul Jerome, Felix Adler, Lou Jacobs and Paul Jung, four of the greatest clowns of the Golden Age posed together. "Natural environment sustains the life of all beings universally. Trees are referred to in accounts of the principal events of Buddha's life. His mother leaned against a tree for support as she gave birth to him. He attained enlightenment seated beneath a tree, and finally passed away as the trees stood wintness overhead." 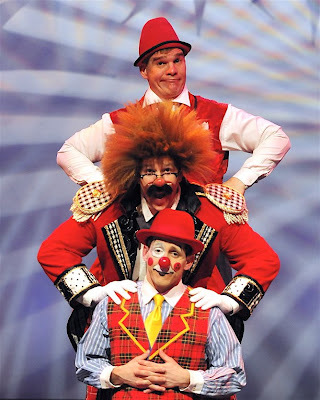 Last week along with Tom Wheaton and Todd Zimmerman, we also had a guest Ringmaster -Mike Naughton. 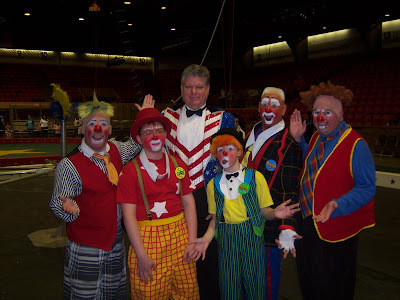 Clowns (From left to right) Tom Wheaton, Josh Potts, Noah Potts, Jeff Potts, Tom Zimmerman, Ringmaster -Mike Naughton. 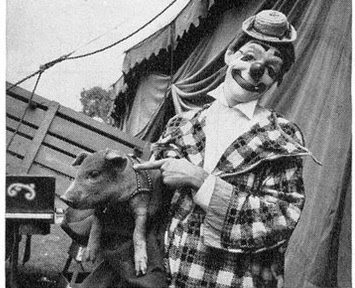 This looks to be an outtake from Martin & Lewis' final film, Paramount's Three Ring Circus, shot in February and March of 1954 on the Clyde Beatty Circus. It might also be from Ring of Fear which was also shot on the Beatty show in 1954, but that was shot by Warners in Cinema Scope and WarnerColor and this looks to me to be in Paramount's Vista Vision. 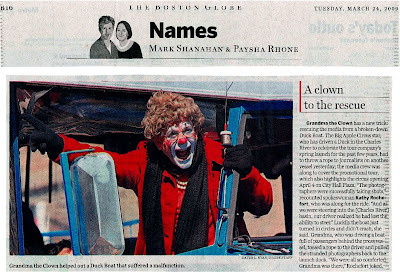 I can't identify any of the clowns in the scene except for Larry Cross, the first one out of the car. Shane and Terry and I went to Surf Taco for lunch today. We used to go to the one in Belmar but they opened one in Long Branch, so we go to that one now. We parked next to a blue car. I just watched Julie Taymor's Across the Universe. I had avoided seeing it in theaters. I'm glad that I did. The music of the Beatles means quite a bit to me. It means quite a bit to a great many people. Why is it then that something so wonderful, so universal, so timeless as the Beatles music is reduced to the level of an '80s music video starring the cast of the O.C., even in the hands of someone as creative as Julie Taymor? Why is it that in 2009 theater and film have so little understanding of the true power of rock & roll? Watching Across the Universe is for fans of the Beatles' music like listening to Dustin Hoffman on the soundtrack album of Lenny. I just can't see any reason for it to exist. If you liked the original, you'll loathe the re-creation. If you didn't like or are indifferent to the original work, you won't care. So who is it for? Jean Saucier & Patrick Côté from Montreal. 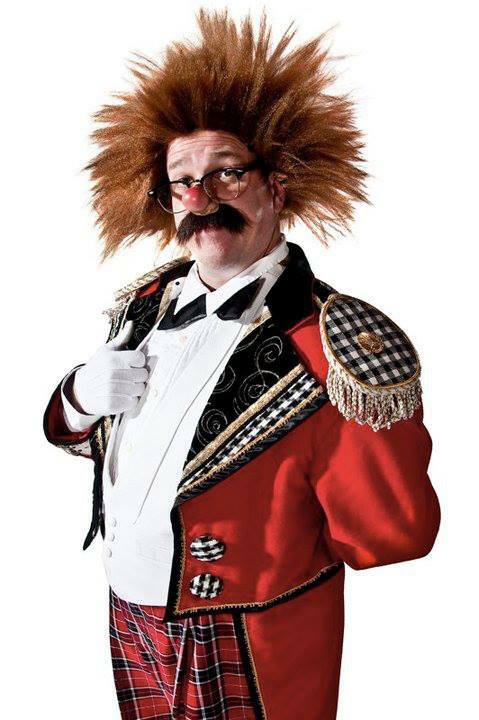 I've seen this show several times with Saucier's former partner Lawrence Smythe. Does anyone know if the show is the same or has Côté brought in new material?